Have you ever thought that? It would be shocking if you said no. I’ve seen so many books, blogs, and posts claiming that if you want to take care of your mental health you need to take care of your diet. 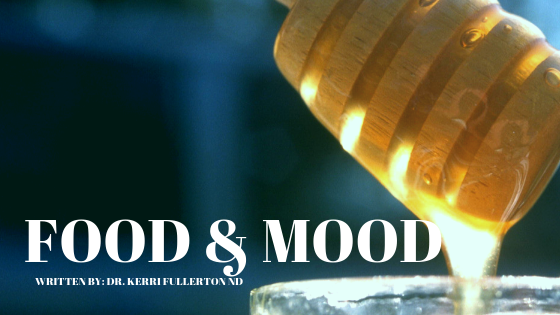 While I won’t disagree that food can impact mood, I’d like to talk to you about how your mood impacts your food. And more importantly, how you can take care of it. When I was about 12 years old I told my mom that I wanted to lose weight. I truly believed that if I could change how I looked then I could change how I felt. And who could blame me? Look at the message of every weight loss or fitness commercial. The before is sad and frumpy. The after is happy and confident. My Mom didn’t want me to do anything crazy so she took me to see the doctor. It was the best of the options that she had at her disposal. The doctor proceeded to ask me what I wanted to weigh, and then told us that I didn’t need to lose weight. But if I was determined, then Weight Watchers was the way to go. It was then, as it is now, viewed as the ‘healthy way’ to lose weight (I’ll do a rant on that another time). Off we went to the first meeting and weigh-in. I was already within my BMI range (again, another rant for another time). But that didn’t stop them from signing me up and helping me lose weight. That was the beginning of my dieting cycle. From age 12 to age 30 I lost and gained 15, 20, 30 lbs, over and over again. Each time I lost, I gained a few more. Now I don’t blame my mother or my doctor. They only did what they thought was best. If they knew then what I know now, they would’ve referred me to a psychologist. Someone who would’ve helped me understand why I thought that my happiness and confidence would be found within how I looked. You see, I was struggling with anxiety, but nobody knew, me included. And the repeated failures at weight loss only added to my anxiety. I developed depression as well. I couldn’t understand my lack of will power. I developed binge eating disorder that progressed to bulimia. I didn’t tell a soul. Food is very powerful at affecting mood. In fact, in can raise neurotransmitters like serotonin and dopamine. It can also decrease the stress hormone cortisol. Lately this has been seen as a bad thing in the media. It’s been called “addiction” when in fact it’s not at all. To create the environment for addiction-like behaviours around food, first you must restrict (hello Weight Watchers). My dieting created more food cravings. 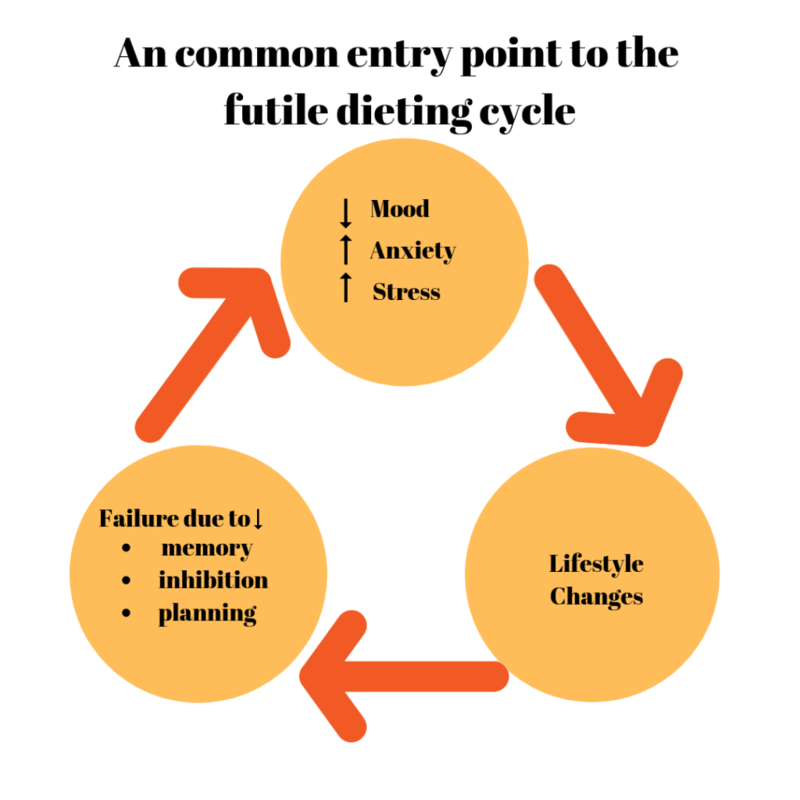 Then to add insult to injury, being in a state of depression, anxiety and or stress, actually limits your ability to implement lifestyle change (eat less, move more). Research published in Basic Clinical Neuroscience last year showed that when we are in a state of stress, depression, and anxiety that our memory is diminished, our impulse control is decreased, it’s harder for us to plan, and we aren’t able to go with the flow as easily. All skills that are required to make lifestyle changes! If this feels a little depressing and frustrating, I hear ya. The good news is that there is a way out of the endless loop of hanging your hopes on the next big thing only to be left feeling like you failed again. I get it – you have weight to lose. And yet very few doctors, nurses, naturopaths, dieticians, fitness trainers or nutritionists are going to first assess your ability to make the necessary changes. Find someone who is going to assess your stress levels, and your mental health status. These pieces need to be addressed first, from a chemical perspective. Does that mean that you have to go on meds? Of course not. There are wonderful herbs, amino acids, and other natural solutions available. Just be sure to seek out professional help – someone who has the training necessary to support this. Someone who won’t shy away from telling you that meds might actually be the best options right now. You can find professionals around the world who have been trained in Intuitive Eating and understand the dangers of prescribing a diet by using this link here: https://www.intuitiveeating.org/certified-counselors/. Yep, I’m on there. That sounds silly I know but you’d be surprised how many people don’t get treated once the problem is identified. Whether it’s “just stress” or it’s depression and/or anxiety, it won’t go away with awareness alone. Some don’t want treatment because they see it as a weakness. They ‘should’ be able to just figure it out. Please know that the chemistry is strong and real. Getting treatment makes you stronger not weaker. Maybe you don’t want treatment because you think that it’s a forever thing. While sometimes that’s true, often the treatment is just a temporary thing. Like using a crutch with a broken leg. Once it’s healed, then you can start rehab and create a lifestyle that will support your healed self. This is where the team approach can be very helpful. Maybe the psychologist identified the problem and you need the naturopath or the MD to help with the treatment side. This is the step that we all want to start at. We want to exercise more and eat better. When you have steps 1 & 2 in place, you’ll be in a position for step 3 to be successful. Lifestyle changes need to be slow, steady and sustainable to have any lasting impact. And that’s what you really want right? You don’t a temporary solution. You’ve been there and done that. It’s time to put the horse before the cart. P.S. If you’d like to chat, book a connection call. It’s free and there’s no pressure. If I can’t help, I probably know someone who can.